Jackson L. Davis III, M.D., is a retired Brigadier General in the Air National Guard. In his last assignment he was assistant to the command surgeon, Air Mobility Command, at Scott Air Force Base, Illinois from October 1996 to November 2000. He also served as the senior medical Air National Guard adviser to the command surgeon of the Air Mobility Command and provided medical liaison between the active Air Force and the Air National Guard (ANG). (Dr.) General Davis was born in Washington, D.C. on August 11, 1944. He attended public schools in the District of Columbia before entering Howard University in 1962. 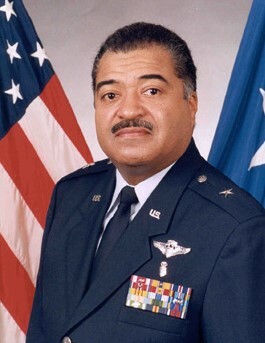 General Davis was commissioned as a Second Lieutenant in the Air Force in 1966 upon completion of the Reserve Officer Training Corps (ROTC) program at Howard University. He received his medical degree from Howard University College of Medicine in 1970, and performed his Internship at Freedmen’s Hospital from 1970 to 1971. After completing his Internship, he entered Active Duty and began his military career as a general medical officer, Bolling Air Force Base, Washington, D.C.. In June 1974, he became a flight medical officer and clinic commander, United States Air Force (USAF) Clinic, Tainan Air Base, Tainan, Taiwan. His last active duty assignment was chief, aeromedical services, Malcolm Grow Medical Center, Andrews Air Force Base, Maryland. Upon honorable discharge from active duty, he performed his Urology Residency at Howard University Hospital in Washington, D.C. from 1975 to 1979. As former Chief Flight Surgeon in the ANG, he has more 800 flight hours on aircraft such as the F-4, KC-135A, P-3, C-130, C-141A, C-9, C-21A, and C-22. Some of his major assignments include: Squadron Flight Surgeon, 459th Tactical Hospital, Andrews Air Force Base; Hospital Commander, 910th Tactical Hospital, Youngstown, Ohio; Hospital Commander, 113th Tactical Hospital, Andrews Air Force Base; State Air Surgeon, Headquarters, District of Columbia Air National Guard, Washington, D.C.; Air National Guard Assistant to the Command Surgeon, Air Mobility Command, Scott Air Force Base, Illinois. A partial list of his medals and awards include: Meritorious Service Medal with two oak leaf clusters, Air Force Commendation Medal with one oak leaf cluster, Air Force Outstanding Unit Award, Air Force Organizational Excellence Award with one oak leaf cluster. (Dr.) General Davis is married to Nadine E. Journiette-Davis. He also is an active member of the National Medical Association (NMA) where he has served as past Chair of the Aerospace Military Medicine and Urology Sections. General Davis retired from the Air Force in November 2001. He is in private practice, specializing in occupational medicine, and is the Medical Director at Northside Medical Services Corporation in Washington, D.C.
“Jackson L. Davis III, National Guard Biography, https://www.nationalguard.mil/Leadership/NGB-GOMO/bio-show/43/; “Jackson L. Davis,” Web MD. https://doctor.webmd.com/practice/northside-medical-services-corporation-8c0dcac5-4703-e211-a42b-001f29e3eb44-overview.